1. Heat the oil in a medium frying pan and fry the fillet of beef on all sides until well sealed and browned. Remove from the pan and set aside until cooled. 2. Add the onion and garlic to the pan and cook gently for 3-4 minutes until soft then add the mushrooms and continue cooking for a few minutes more. Remove from the heat and mix in the thyme and plenty of seasoning. Leave to cool completely. 3. Roll out the pastry to a rectangle large enough to enclose the beef. Spread the tomato paste over the pastry leaving a 5cm rim round the edge, then lay the pancetta slices over the top. Spread the mushroom mixture on top of the pancetta and place the fillet in the centre. 4. 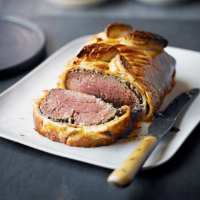 Brush the pastry edges with cold water then wrap the beef in the pastry to form a neat parcel, tucking in and sealing the edges. Place on a greased baking sheet with the seam underneath and decorate the top with leaves using any pastry trimmings. Make a couple of slits in the pastry for steam to escape. Chill for 15 minutes or until ready to cook. 5. Preheat the oven to 220°C, gas mark 7. Brush the pastry with beaten egg and bake in a hot oven for about 40-45 minutes (for rare beef) until the pastry is golden. For medium or well-done meat, lower the oven to 180°C, gas mark 4 and cook for a further 10-20 minutes. Leave to rest for 10 minutes before cutting and serving in thick slices with new potatoes and steamed green vegetables such as green beans or broccoli.